If you want to be at peace with yourself and the world around you, then stop comparing yourself with others. 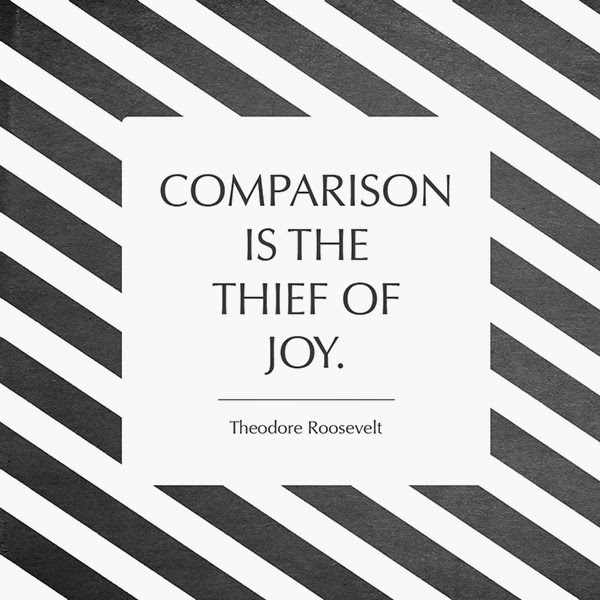 Comparison is a lousy mind game. It works big time especially when someone else has got what you don’t have. When someone has a better job or car or spouse or whatever that you don’t have, your mind will keep prompting you to look at that person a bit differently. You will start imagining that this person perhaps does not deserve what she or he has and that you deserve it more. But your imagination, your wishing something alone, cannot make it a reality. As in, for instance, your imagination alone cannot get you that better job or car or whatever. So, when you don’t get what you want and instead when you keep pining for it, you suffer. Your expectations in this context are futile and are what are causing you agony. The only way then to end your self-inflicted suffering is to simply stop comparing yourself with others. You must remember that each person’s Life is engineered differently. It is not necessary that everyone has everything at all times. And when you don’t have something, just live with that reality. Don’t pine for it, citing another person as having what you want, and believe that you are justifying your case better. Indeed, to whom are you justifying and how can any justification work with Life? For instance, a friend lamented yesterday that while he is out of job and is facing rejection from every quarter, someone who is less-skilled and less-experienced than him has bagged the CEO’s job in a company where he once worked. My friend feels ethics and meritocracy have taken a backseat in today’s corporate world. Possibly. But my friend must realize that his grief is compounded by the fact that someone else has a job while he does not. And this is exactly the point that I am trying to make. When you don’t have a job, focus simply on trying to get one. Don’t focus on analyzing why others have a job while you don’t. This analysis is worth it, if it is constructive and if it can help you prepare and present your candidature better. But it can be very debilitating and destructive if you merely choose to compare yourself with others and wallow in self-pity. Simply, in any situation, don’t compare yourself with others. Not when you have what others don’t. And never when you don’t have what others do. Comparisons ruin your inner peace. Protect it by looking within and expunging any comparison whatsoever. Drop all disappointments. Live free! Live Life without regrets, without disappointments. When you live this way, you will see how magical and beautiful your Life is. A friend invited me for a drink a few days ago. Along with him, at the bar, was his boss, Hemant. After the introductions were made, Hemant was keen to know what my Book, ‘Fall Like A Rose Petal – A father’s lessons on how to be happy and content without money’ (Westland, August 2014), was all about. So, I gave him a background and said that my Book’s message was really about accepting Life for what it is and learning to be happy despite the circumstances. I smiled, and explained my perspective to Hemant and my friend. It is not that I had not felt disappointed before. It is not as though I don’t feel disappointed when our efforts to put our business back on track fail every single time that we try. But you learn, I told them, to not carry a disappointment in you when you realize its futility. 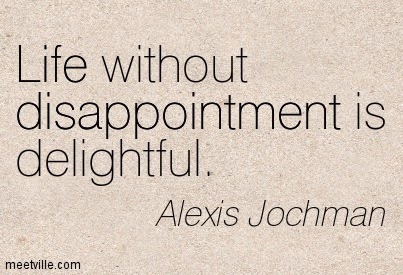 What is a disappointment? Simple – an unfulfilled expectation is a disappointment. A lost opportunity is a disappointment. But Life does not bother whether you have an expectation or not. If you have an expectation from Life, and it goes unfulfilled, it is your problem. Life just goes on. Similarly, you got an opportunity, and if you blew it, it’s your problem. Life gave you that opportunity, you did not make use of it. Who is to blame? And what is the point in holding on to the blame, the guilt, the disappointment – the lost moment, the lost opportunity is never going to come back. So, why feel disappointed? In my case, there’s a lot of scope for disappointment – I need not have taken some business decisions that led to our Firm’s bankruptcy and to my family being pushed to the brink of penury; I ought to have saved money for our children’s future, when our business was doing very well, and when my wife used to implore me to do so. That time’s gone. Those questionable decisions were made. The opportunities were lost. Events happened and we are in the state we are in. What has happened is irreversible. What’s the point in being disappointed now about whatever has happened in the past? Understanding and avoiding disappointments helps in any context in Life. A disappointment always brings grief and depression along with it. Together they make a debilitating cocktail of emotions that can hold you hostage forever. Instead of being a slave to these emotions, be free. Learn from your mistakes, your choices, your decisions and let go of all disappointments and guilt. Forgive yourself for what you did. Forgive others for what they have done. When you do this, you will feel phenomenally peaceful. When you anchor in this inner peace, you will experience the beauty and magic of each moment. Author AVIS ViswanathanPosted on December 1, 2014 March 14, 2016 Categories Agony, Art of Living, Disappointments, Expectation, Fall Like A Rose Petal, http://schemas.google.com/blogger/2008/kind#post, Inner Peace, Intelligent Living, Live Free, Opportunity, Penury, Suffering, Westland BooksLeave a comment on Drop all disappointments. Live free! Have you ever wondered what makes you angry? Is it the object or circumstance or outcome you desire that makes you fret, fume and lose control over yourself or is it your desire itself? All the time, you will discover when you think through this, it is your desire that gets you all keyed up. Consider these situations: 1. You order a coffee and it arrives lukewarm. You get angry. Is the coffee to be blamed for your anger? Or is the waiter responsible for it? Or is your desire that the coffee be warm fuelling your anger? 2. You see a passenger cutting across an airline check-in queue. Who is responsible for your anger: your desire for decorum among public or the insensitive passenger? 3. Your boss doesn’t give you an opportunity you truly deserve. Is your irrational boss to be blamed for your anger or is your perfectly rational expectation making you angry? Remember that the discussion here is on what makes you angry and not whether the circumstance or person in question is right or wrong. The onlyway to deal with anger is to understand that it is your unfulfilled desire/expectation that causes you to get angry over any situation. And so start with yourself first on this journey to know how to manage your anger. All your efforts to change the environment and people around you will produce zero results. However, you can cover major ground when you seek within. When you go within, tempering your expectations, you end up learning to control your emotional outbursts, conserving oodles of energy, and, invariably, you will find more peaceful, purposeful, productive methods to change the environment, people and circumstances that angered you in the first place. Change every ‘Damn!’ or ‘How dare you?’ that arises in your mind, with, ‘Interesting!’ or ‘How can I stay calm and help myself?’ statements. This is not as difficult as it seems. Most of the time we miss the opportunity to be calm in a challenging situation because we take a person or an event very seriously. Instead take everyone and everything lightly. If something happens the way you wanted it, great! If it falls short of your expectations – try to get it to your standards. If you can’t still get it to be the way you want it, shrug your shoulders and move on. 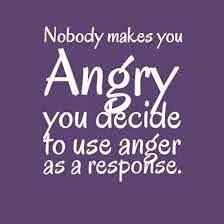 Getting angry is only going to make you feel more miserable. Your anger may be directed at someone or something else. But remember it arises from within you. It has to first harm you, vanquish you, before it even strikes the other person or thing at whom it is directed. I have read Osho, the Master, tell the story of a great Sufi mystic, Junnaid. Every evening, in his prayers, Junnaid used to thank creation for its compassion, for its love, for its care. Once it happened that for three days Junnaid and his disciples were traveling and they came across villages where people were very anti-Junnaid, because they thought his teachings were not exactly the teachings of Mohammed. His teachings seemed to be his own and people thought that he was corrupting them. That is a big learning for us. Don’t take yourself or anyone else or anything seriously. Be easy. Take it easy. Anger is one of the biggest source of draining the cosmic, spiritual, energy in you. If you can learn to productively channelize all the energy that you expend when you are angry, you will have scaled one of the highest peaks of self-realization.